The life drawing scene in Perth is pretty active. At last count it was about 20 regular groups that I know of and I am sure there are more. Also life drawing groups are becoming a little more co-ordinated with one another which means that it is now possible to catch a life drawing gig probably every day of the week. Best, there is a real sense of sharing information and support for groups just forming. As this list is just starting out, let me know if you have a regular group and I will add it to this list or update your information. There is also now a ‘Life Drawing in Perth’ Facebook page that is really good to join if you want to keep up to date with gigs and models info. Floreat Group, now the Dalkeith group. This longstanding group has now moved from Hackett Hall. Meets at the Victoria League premises, an old world, wood paneled and carpeted room. The address is 276 Onslow Road, Corner Kings Street Shenton Park. Poses start at 1 minute and progress up to 20 minutes. BYO materials, there are tables but you are welcome to bring your easel if you prefer. $15 per evening, casual basis. Casual Life Drawing Sessions are held on Sunday mornings. Atwell house is on the corner of North Lake Rd and Canning Hwy. Parking is OK but entry is only from the West on Canning Hwy. 2.00pm to 5.00pm – Please arrive early to set up and be ready for a 2pm start. Cost: $20 – includes afternoon tea. Usually single pose. Limited to 10 persons. Shirley runs a group on Friday mornings at her home in Bayswater 10am until 1pm. Good lighting and atmosphere. Range of poses and also some long pose painting sessions. Check with Shirley first about attending as she has ‘regulars’ and space is limited. 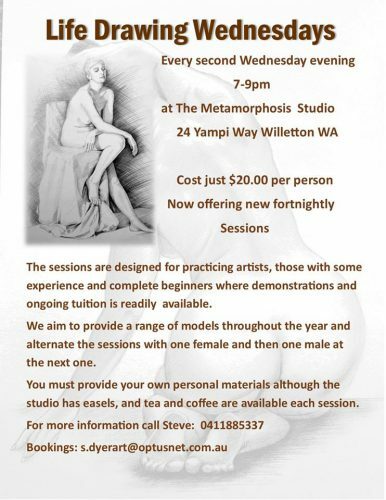 The MJAC life drawing sessions will be untutored, with a model provided each week and facilitated by Carolyn Francis. Newcomers welcome!